Sonoma Co. since 1954. Certified organic by Oregon Tilth. Grade AA. Cage free. American Humane Certified. One dozen. USDA organic. Local California family farms. Since 1916. Organic is always non-GMO. 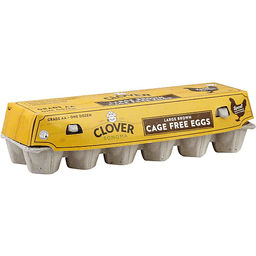 No antibiotics or hormones (No antibiotics were administered to the hen's diet or to the hen. No hormones are used in the production of shell eggs). Delicious golden yolk. Freshness guarantee. Vegetarian fed. Clover Cares: Come learn more about how Clover Cares in the community. www.CloverSonoma.com. Connect with us: Facebook; Twitter; Pinterest. CA SEFS Compliant. Carton made from 100% reclaimed paper. Certified organic by QCS. Welcome to Clover Country: For three generations we've been using our best knowledge to produce quality dairy products that honor our family farms, the environment and the communities we serve. 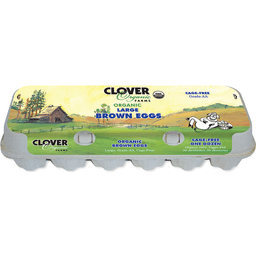 Happy Hens, Wholesome Eggs: Clover organic eggs come from happy, healthy hens who have access to the great outdoors and the run of a large indoor hen house. 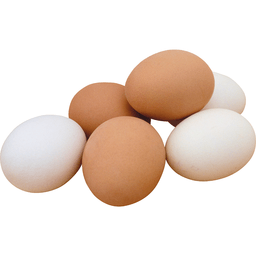 They enjoy a balanced, vegetarian diet, because what a hen eats contributes to the quality of her eggs. 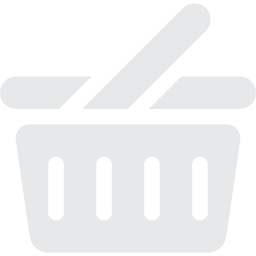 Delivered within days from out Northern California grocer, you can taste their exceptional quality and freshness. For more information on Clover Eggs, please visit www.CloverSonoma.com. Grade AA. American Humane Certified. One dozen. Local California family farms. Since 1916. No antibiotics or hormones (No antibiotics were administered to the hen's diet or to the hen. No hormones are used in the production of shell eggs). Delicious golden yolk. Freshness guarantee. Vegetarian fed. Clover Cares: Come learn more about how Clover Cares in the community. www.CloverSonoma.com. Connect with us: Facebook; Twitter; Pinterest. CA SEFS Compliant. Carton made from 100% reclaimed paper. Welcome to Clover Country: For three generations, we've been bringing you the highest quality dairy products, while pioneering animal welfare standards and protecting our lands for future generations. Freshness you can see and taste - You don't have to live on the farm to enjoy the delicious flavor of an egg, freshly pulled from the hen house. Crack open one of ours, and you'll see. Delivered within days from our Northern California family farms to your local grocer, you can see their rich golden yolks and taste their farm fresh flavor. I'm a local. For more information on Clover Eggs, please visit www.CloverSonoma.com.